The Best Christmas Lights in the Country? If you want a great example of the community spirit here in Portishead, look no further than our wonderful, annual Christmas lights. Managed by a committee of residents, an army of volunteers raises money all year. Add donations from local businesses and our Christmas lights extend further every year. Around the beginning of November, more volunteers join the army for one weekend to hang and test the lights. In 2018, Rosemary and Matt Westley, retiring owners of Portishead’s most famous shop, Morgan Westley, switched on our wonderful Christmas Lights, at a ceremony MC’d by our own BBC personality, Jemma Cooper. At the appointed hour, Santa made his way from Clarence House,to the stage opposite The Precinct. His elves happily received letters from excited youngsters on the way. The lights now stretch for more than a mile, from the youth centre on the corner of Harbour Road, to the end of the High Street just before Gordano School. New areas are added each year, and now include Waitrose Piazza, the tower at St Peter’s Church and parts of Wyndham Way. 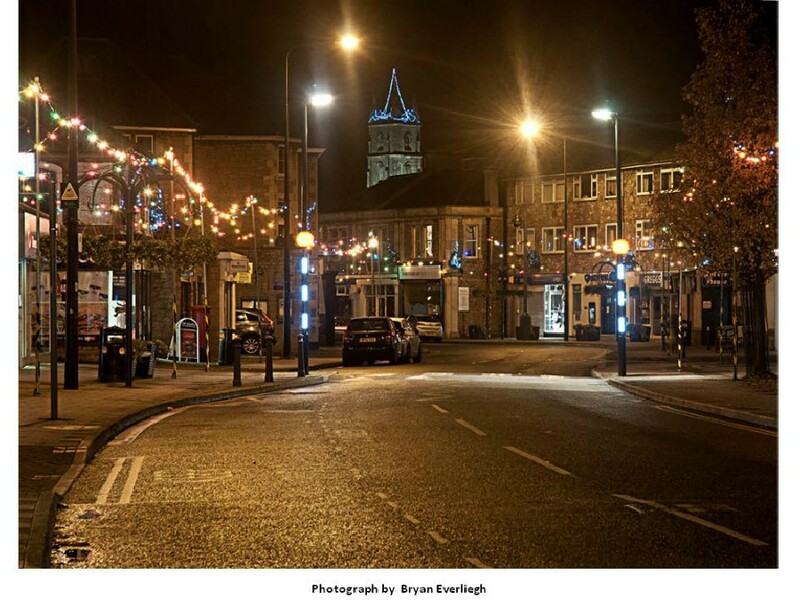 There are also lights on the Triangle, West Hill, which also improve each year. Particular thanks to all the sponsors this year, Future Bathrooms being the main sponsor again. Portishead Town Council also makes a substantial donation each year, with other sponsors include F H Halliday & Son, Portishead Motorcare and Dolphin Lifts (Western). Thanks to producer Chris Fielden, his brother Dave, and neices Elspeth and Scarlett for shooting and editing the movie. Music provided by Airbus, one of the first bands ever to use the new music studio (open to all young people) at the Portishead Youth Centre.